Combine the two (arguably) most loved sports by men and what do you get...? 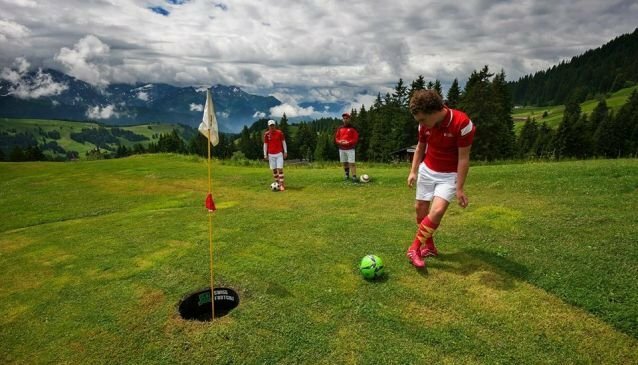 Footgolf! This fantastic sport can be found at El Campanario Golf Club, where you can enjoy two sports in one. Basically you play a round of golf using a footbal instead of a golfball and clubs. Scoring is just like golf too; you must get around the course in the least amount of kicks as possible, and don't worry, the holes are modified on the course so the football can fit! This really is a brilliant activity to try out, perfect for stag parties, corportate events and birthday celebrations. And of course women and children of all ages can play too; it's not just for the fellas. Adults €15 plus €5 ball rental in required. Discounts for groups, students and children under 10 play for free!